32 | Washington Athletic Club Magazine | MAY / JUNE 2016 W ith summer on the horizon, adventure awaits for WAC juniors. Take advantage of everything Seattle has to offer. 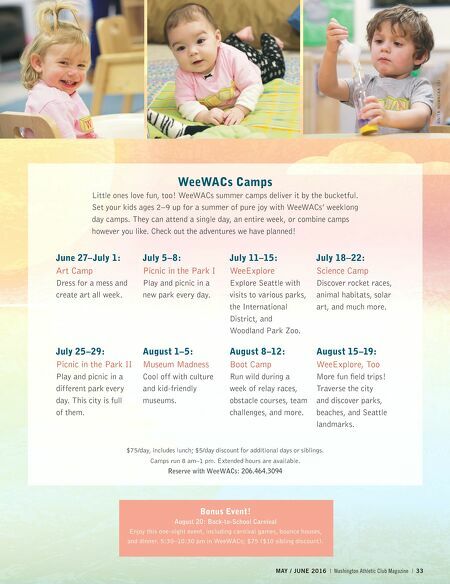 Sign your kids ages 6–12 up for WAC Juniors Summer Daze. Featuring a weekly Wednesday field trip, the excitement of these day camps will knock their flip-flops right off. Intrigued? Check out the full schedule below. Just don't be surprised if your campers come home with a new love for rock climbing, tunnel exploring, or even butter churning. After all, anything can happen in summer. June 29: Pioneer Days Explore historic Pioneer Farm Museum & Ohop Indian Village in Eatonville. July 6: Get Active! Enjoy a nonstop day of rock climbing, swimming, and bubble soccer. July 13: Art Camp! Break out the smock and let your artistic side shine. We're off to Seattle Glassblowing July 20: Mariners Mojo Watch the Mariners take on the White Sox before you cool off in the WAC pool. July 27: Game On Jump aboard for a day at Tukwila's Family Fun Center. August 3: Seattle Science Discover the mad scientist within at Pacific Science Center and take a run through the fountain. August 10: Adventure Camp Explore an abandoned tunnel before visiting Cougar Mountain Zoo. August 17: I Spy Put on your detective hat. You're going to need it on this scavenger hunt from the WAC to Lake Union by land and boat. Find complete descriptions of WAC Juniors Summer Daze, including times and pricing, on pages 39–40. 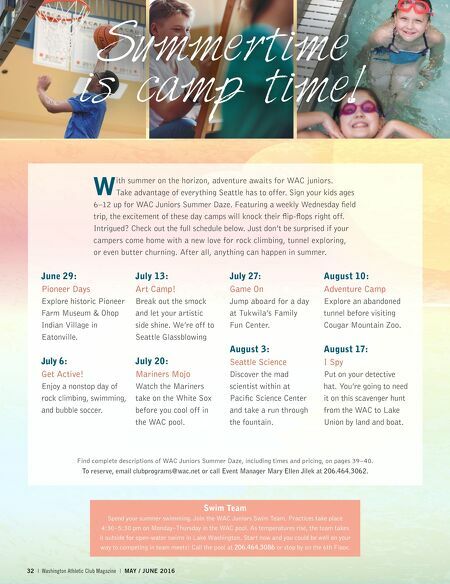 To reserve, email clubprograms@wac.net or call Event Manager Mary Ellen Jilek at 206.464.3062. Swim Team Spend your summer swimming. Join the WAC Juniors Swim Team. Practices take place 4:30–5:30 pm on Monday–Thursday in the WAC pool. As temperatures rise, the team takes it outside for open-water swims in Lake Washington. Start now and you could be well on your way to competing in team meets! Call the pool at 206.464.3086 or stop by on the 6th Floor. Summertime is camp time!